Sugar High Friday # 16, as decreed by Jennifer is all about improving the collective Valentine's Day with Aphrodisiac foods. Almonds - Throughout time almonds have been associated with desire and fertility. Epitomised by Sampson's wooing of Delilah. Pine Nuts - The Romans believed in the aphrodisiac power of the pine nut ; many a libido was stirred in Medieval times with a handful of pine nuts. Honey - Honeymoon, my honey, who doesn't believe honey is seductive? Basil - Stimulating to more than just the circulation, basil is also said to have a scent that drives men wild! Aniseed - The ancient Greeks and Romans knew aniseed had special powers ; we now know anise contains estrogenic compounds - one way to increase your desire. So what to do with that lot? Baklava, or more specifically as it shall be named for the occasion Baklover! I thought a mixture of chopped almonds and pine nuts could replace the more usual pistachio or walnuts. Honey could be included in the syrup. And why not combine the basil and the aniseed in the one plant and use Thai basil which I find to be basil with an aniseed taste, and infuse the syrup with the leaves? Make the syrup by dissolving the sugar in the water with the lemon juice then boil for a couple of minutes or until the syrup coats a spoon. Stir in the honey and the basil leaves. Remove the basil leaves after a minute. Cool, then chill the syrup. Preheat the oven to 180°c. Have ready an oven proof dish the size of half a sheet of phyllo. Layer half the phyllo in the dish brushing melted butter between each layer and folding each sheet in half. Spread the nuts over this layer of pastry. 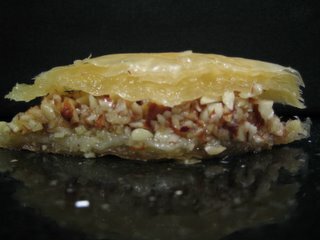 Continue layering and buttering the remaining phyllo to cover the nuts in the dish. Butter the top layer. Cut the nut-pastry stack into diamond shapes right to the bottom. Bake for 30 minutes or until it is golden and puffy. Pour the cold syrup over the hot pastry the moment it comes out of the oven. Leave to cool then recut and remove from the dish. Eat with your fingers and be aware of the consequences! Notes : I had not made baklava before this and I think I probably should have before I started to experiment. I do not think I chopped the nuts finely enough and therefore it fell apart a bit too much. I think I might have left the basil in the syrup too long - much longer than the minute I specified above. But all in all I rather liked it - the basil syrup was less cloying than the traditional rose water or orange blossom flavours I have eaten, almost savoury in a strange way. I think the infusion of herb flavours in deserts is wonderful, but the intensity needs to be managed. So many seductive ingredients! How could your lovely baklover not work? Thanks for taking part in this Sugar High Friday. Look for a round up by the end of the weekend! You are ambitious to try making baklava! It sounds delicious. The basil sounds like a great touch. That looks finger licking good Emma! What's happened to your template, I can't seem to load your links? I adore baklava! And I'm afraid I'm lazy. The lady (I believe she is Romanian) who runs our favourite beans and grains store (in Kensington Market, for anyone who lives in Toronto) makes fantastic baklava. We buy pieces of it when we need a baklava fix. Hers is made with walnuts. And there are a couple of bakeries in Greektown that make stellar baklava with pecans or almonds. But the absolute best baklava I had was some years ago on business in Calgary (I'm afraid I don't remember the name of the Lebanese restaurant) Their baklava had been made with pistachios. It was phenomenal!